Guglielmo Marconi (25 April 1874 – 20 July 1937) was an Italian inventor and electrical engineer. He was a pioneer of long-distance radio transmission. which he used to build up a radio telegraph system. Marconi is often named as the inventor of radio. He shared the 1909 Nobel Prize in Physics with Karl Ferdinand Braun. Much of Marconi's work in radio transmission was built on previous experimentation, and work by others. When he was twenty years old, he learned of the experiments of Hertz, Popov, Lodge, Bose, and Tesla. He began his own experiments. 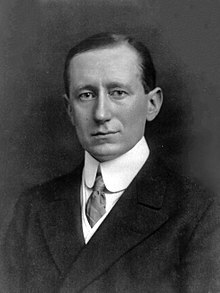 As an entrepreneur, businessman, and founder of The Wireless Telegraph & Signal Company in Britain in 1897, Marconi became wealthy in the business of radio, mainly for ships at sea. In 1924, he was ennobled as Marchese Marconi. Back in Italy, he went on to become a member of the Grand Council of Fascism. ↑ "Guglielmo Marconi – the father of long distance radio communication – an engineer's tribute". ↑ "Guglielmo Marconi: The Nobel Prize in Physics 1909"
↑ "Welcome to IEEE Xplore 2.0: Sir J.C. Bose diode detector received Marconi's first transatlanticwireless signal of December 1901 (the "Italian Navy Coherer"Scandal Revisited)". Ieeexplore.ieee.org. Retrieved 2009-01-29. ↑ Roy, Amit (2008-12-08). "Cambridge 'pioneer' honour for Bose". The Telegraph. Calcutta: Telegraphindia.com. Retrieved 2010-06-10. ↑ Williams H.S., & Williams E.H. 1910. Every-day science. New York: Goodhue Company. Page 54. This page was last changed on 19 June 2018, at 15:08.